Every day many websites are going live with as many design concepts, we encounter some of the best designs we have ever seen and on the other the hand, sometimes we come across so silly designed websites that prove to be a coffin for that website. Any new visitor coming to that particular website will found himself lost and will abandon the website with that kind of design. 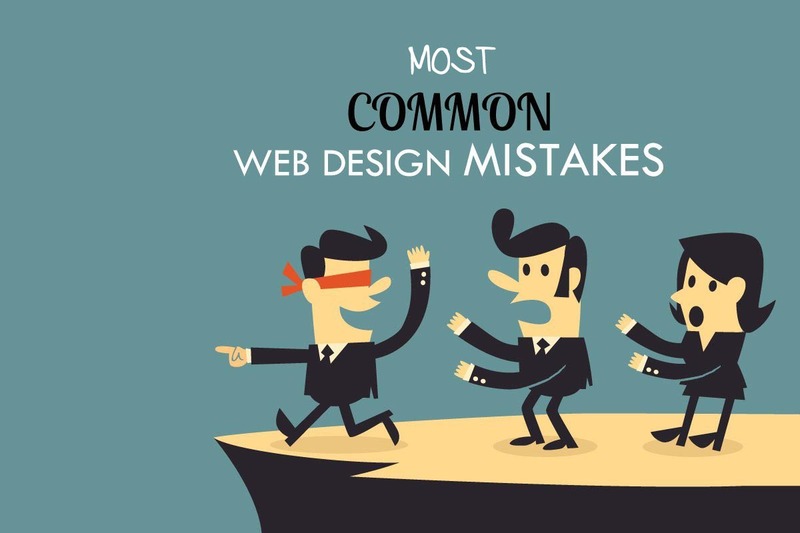 So, now the big question is how should we design our website or what are the most common web design mistakes web designers make? Building a website can be daunting but the real challenge lies in making it usable. The problem is most web designers forget that the website wasn’t created for themselves but to solve the users’ needs. They give creativity priority over practicality and usability. Out of many mistakes that we may or may not have seen, we are going to talk out the most blunderous mistake web designers do. The web is like an archive of information. Whether it’s a corporate website or merely a blog, a search box is essential. The visitor might be looking for something that is hidden within the website, with the search box, chances are, visitors will get what they want. Suggestions: Google Custom Search is a neat, simple and effective way to get started. It enables visitors to search your site in an efficient manner. Just copy the HTML code from the control panel and paste it into your website and that’s it, you’ve got a search function right on your website. This is a crucial element of web design. Of course, a good interface design will grab the users’ attention but users have to read the text to be able to grasp the information they desire. Some websites use the most bizarre font styles and sizes that make reading a pain. Suggestions: Fortunately, there are simple ways that you can do to improve the users’ reading experience on your website. Compare color schemes of most major sites and notice how the colors improve readability. A good place to try out different color schemes is Adobe Kuler. A website’s content is what drives traffic to it. How the content is structured is what will make it a success or a failure. Users do not read unless absolutely necessary but scan through information and pick out points of interest on a web page. Some designers just put a block of text on the web page and totally neglect headings, sub-headings, bullets, keywords, paragraphs, etc. Use an appropriate page title for each web page so users know exactly where they are. Some designers even forget to name the web page. Overall, the worst in this category will be putting inaccurate, inaccessible, insignificant or out-of-date content on your website. The content must coincide with the overall theme of the website and be useful. If a page is under construction, why bother putting it up? If a designer really must, then it is only temporary and 3 weeks will no longer be deemed temporary. Suggestions: Organize content on your website using HTML and CSS should be used when creating the design of your pages. Create enough whitespace between your text and images by using margins. Update and be consistent. The purpose of updating is not just to add new content but to spot and correct past mistakes. Navigation within a website should be seamless. Users should be able to find their way around easily. While there is no standard for navigation within a website, especially now as more new web development technologies emerge, it is imperative to understand that navigation must be intuitive and consistent. If the text is used as navigation, it should be concise. Visual metaphors should not be re-invented. If hyperlinks are used, then they should stand out from the body of the text. Dead links should have no place on any web page whatsoever. This increases user confusion and wastes time. And one that is even just as worse is having a link on the homepage that links to the homepage. Organize and structure your navigation in tandem with the theme of the website. Personal websites can afford to be more creative yet accessible but a business website requires more efficiency and clarity. Remember, if users can’t find what they want in less than 3 clicks, most will leave immediately. Excessive creativity can be just that. Excessive! Some designers take it to another level when creating websites by creating different designs for every web page within a website. This is by no means confusing to the user. And utterly annoying. No matter how outstanding and attractive a website is, if the overall look and feel is not consistent, users cannot relate to it and feel less in control. Thus, leaving as soon as they arrived. Use a standard consistent template for every page with links to the main sections of the site. The keyword is simple. Create aesthetically simple designs and users will never get confused on your website. I’m sure we’ve visited websites where you have to scroll horizontally. This is an absolute no-no in modern web design. A good designer will develop websites that fit on most screen sizes. The currently optimized layout for websites currently is 1024 x 768 pixels. Check your stats – Analytic services like Google Analytics provides you information about what monitor resolution they are using. These are useful information you should know before initiating your next revamp. W3 Schools Browser Stats – W3 Schools gives clear lists of the most popular browser used by netizens and sort them according to popularity. There are other interesting and important statistics too. Registration forms are tricky. How much information do you require from the user? Gone are the days where a user had to enter a zillion details to register to your website. Some websites make most registration fields mandatory and validate the fields to the extent where the user is frustrated after a few tries. Remember, users, visit a website to acquire information. Not the other way round. Someecard‘s simple form makes registration painless. Suggestions: Compare registration forms across communities on the web and understand what basic information is required of the user during the registration process. More: 9 Common Usability Mistakes In Web Design – This post on Smashing Magazine takes an in-depth look at registration forms amongst other usability mistakes. Too many images on a web page is a huge turn-off. Images can be used to capture users’ attention but it can also be a distraction or just plain aggravating. Images should be used to illustrate and guide the user where appropriate. Animations are awesome and a powerful medium. Especially when used appropriately. When it’s a cycle or just too much on a web page, it gets on the users’ nerves. Users don’t have the patience, time or resources so designers must offer alternatives or better yet, the skip button if it’s a full page animation. More: Flash: 99% Bad – Use Flash appropriately. It’s been almost 10 years since Jakob Nielsen published this article but it’s still relevant in terms of Flash usability especially the Breaks Web Fundamentals piece. Too many designers forget about whitespace and its importance. They are so engulfed in their own design creativity that they forget that it’s not about them. Thus, they try to cram as much as they can onto a single page. End result? A busy, cluttered and unreadable page. kylestanding make good use of whitespace in their design. Users don’t want cool, they seek efficiency. And yes, 99 percent don’t care about the music on your website. Some designers make it worse by putting different background music on every web page. Suggestions: Don’t use background music, but if you must, create a frame for the code and user controls. That way, the music loops continuously, instead of changing each time a new page is loaded within the website. And the user can stop or pause whenever. K.I.S.S is the bottom line, oh I meant Keep It Simple, Stupid. And that is actually what people are liking most in a website, if it is simple, it’s easily usable. Hope you have gained much of insight on common web design mistakes. With mistakes, also comes inspirations, so don’t forget to read Top 10 Web Design Trends and Few Ways To Make Your Site Easily Accessible.